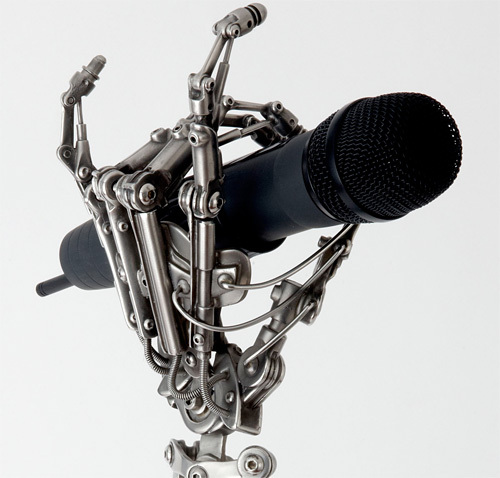 Biomechanical Mic Stand | OhGizmo! Created by Chris Conte for Three Days Grace’s lead singer Adam Gontier, this one of a kind custom-made mic stand appears to literally hold the microphone during a performance. The arm was based off a similar design Chris had already created, but the band wanted a left arm instead of a right which required him to sacrifice and reverse-engineer the original in order to make the necessary molds and casts to create the three copies of the new design. Like a traditional mic stand the arm breaks down into easily transportable smaller bits which are all made of stainless steel and took Chris about three months to make. And it made its first official onstage appearance at a performance on February 19 at the Prudential Center in New Jersey. This thing is amazing, but I kinda noticed something about the base. Is that center piece made out of a car gas tank door? I have a Mitsubishi Eclipse Spider, and I swear the gas door on it looks identical. It suits the design, I'm not knocking it or anything, was just wondering.